The Portugal stamps of the later part of the reign of King Luis I included new design types and a rather complex array of varieties. During this period, many different production methodologies were employed, involving different types of papers and various perforation gauges. Only images of the major denomination types, as listed in the Scott catalog, are shown on this page. Each of these groups will contain catalog detail tables, separated by paper types. The tables themselves will contain all the perforation gauge types that were produced on that particular paper. Reprints exist of most of these Portugal stamps, so care should be taken when purchasing mint condition examples. Collecting used condition examples is fairly safe! Of course, for the specialist, having some reference examples of the reprints might be a good idea, as they can be used to compare with the original stamps. 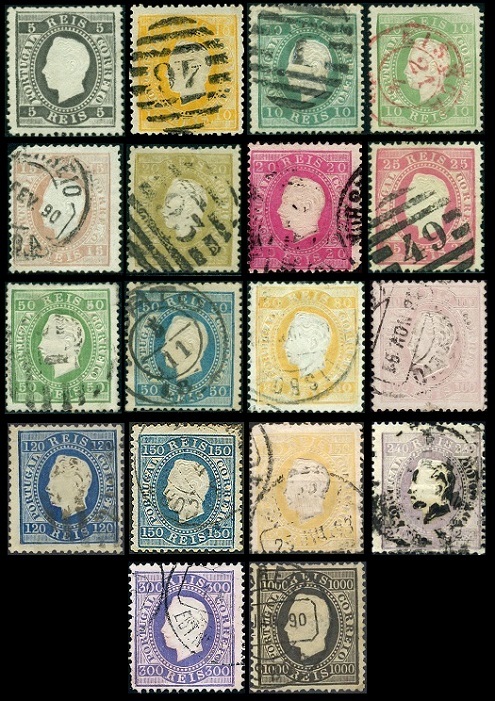 The eighteen definitive Portugal stamps shown above were issued between 1870 and 1884. These new designs all have the embossed profile of King Luis I. 0005 R. (1870 - Perf. 12 1/2 - Sc. #34) - Black. 0010 R. (1871 - Perf. 12 1/2 - Sc. #35) - Yellow. 0010 R. (1879 - Perf. 12 1/2 - Sc. #36) - Blue Green. 0010 R. (1880 - Perf. 12 1/2 - Sc. #37) - Yellow Green. 0015 R. (1875 - Perf. 12 1/2 - Sc. #38) - Lilac Brown. 0020 R. (1870 - Perf. 12 1/2 - Sc. #39) - Bister. 0020 R. (1884 - Perf. 12 1/2 - Sc. #40) - Rose. 0025 R. (1870 - Perf. 12 1/2 - Sc. #41) - Rose. 0050 R. (1870 - Perf. 12 1/2 - Sc. #42) - Pale Green. 0050 R. (1879 - Perf. 12 1/2 - Sc. #43) - Blue. 0080 R. (1870 - Perf. 12 1/2 - Sc. #44) - Orange. 0100 R. (1871 - Perf. 12 1/2 - Sc. #45) - Pale Lilac. 0120 R. (1871 - Perf. 12 1/2 - Sc. #46) - Blue. 0150 R. (1876 - Perf. 12 1/2 - Sc. #47) - Pale Blue. 0150 R. (1880 - Perf. 12 1/2 - Sc. #48) - Yellow. 0240 R. (1873 - Perf. 12 1/2 - Sc. #49) - Pale Violet. 0300 R. (1876 - Perf. 12 1/2 - Sc. #50) - Dull Violet. 1000 R. (1884 - Perf. 12 1/2 - Sc. #51) - Black. 0005 R. (1870 - Perf. 13 1/2 - Sc. #34d) - Black. 0010 R. (1871 - Perf. 13 1/2 - Sc. #35d) - Yellow. 0010 R. (1879 - Perf. 13 1/2 - Sc. #36a) - Blue Green. 0010 R. (1880 - Perf. 13 1/2 - Sc. #37a) - Yellow Green. 0015 R. (1875 - Perf. 13 1/2 - Sc. #38a) - Lilac Brown. 0020 R. (1870 - Perf. 13 1/2 - Sc. #39c) - Bister. 0020 R. (1884 - Perf. 13 1/2 - Sc. #40a) - Rose. 0025 R. (1870 - Perf. 13 1/2 - Sc. #41d) - Rose. 0050 R. (1870 - Perf. 13 1/2 - Sc. #42a) - Pale Green. 0050 R. (1879 - Perf. 13 1/2 - Sc. #43a) - Blue. 0080 R. (1870 - Perf. 13 1/2 - Sc. #44c) - Orange. 0100 R. (1871 - Perf. 13 1/2 - Sc. #45b) - Pale Lilac. 0120 R. (1871 - Perf. 13 1/2 - Sc. #46a) - Blue. 0150 R. (1876 - Perf. 13 1/2 - Sc. #47b) - Pale Blue. 0150 R. (1880 - Perf. 13 1/2 - Sc. #48a) - Yellow. 0300 R. (1876 - Perf. 13 1/2 - Sc. #50a) - Dull Violet. 1000 R. (1884 - Perf. 13 1/2 - Sc. #51a) - Black. 0005 R. (1870 - Perf. 11 - Sc. #34b) - Black. 0010 R. (1871 - Perf. 11 - Sc. #35b) - Yellow. 0020 R. (1870 - Perf. 11 - Sc. #39b) - Bister. 0025 R. (1870 - Perf. 11 - Sc. #41b) - Rose. 0050 R. (1870 - Perf. 11 - Sc. #42b) - Pale Green. 0080 R. (1870 - Perf. 11 - Sc. #44b) - Orange. 0240 R. (1873 - Perf. 11 - Sc. #49b) - Pale Violet. 0005 R. (1870 - Perf. 14 1/2 - Sc. #34c) - Black. 0010 R. (1871 - Perf. 14 1/2 - Sc. #35c) - Yellow. 0025 R. (1870 - Perf. 14 1/2 - Sc. #41c) - Rose. 0080 R. (1870 - Perf. 14 1/2 - Sc. #44a) - Orange. 0100 R. (1871 - Perf. 14 1/2 - Sc. #45a) - Pale Lilac. 0005 R. (1870 - Perf. 12 1/2 - Sc. #34e) - Black. 0010 R. (1871 - Perf. 12 1/2 - Sc. #35e) - Yellow. 0020 R. (1870 - Perf. 12 1/2 - Sc. #39d) - Bister. 0025 R. (1870 - Perf. 12 1/2 - Sc. #41e) - Rose. 0050 R. (1870 - Perf. 12 1/2 - Sc. #42c) - Pale Green. 0080 R. (1870 - Perf. 12 1/2 - Sc. #44d) - Orange. 0100 R. (1871 - Perf. 12 1/2 - Sc. #45c) - Pale Lilac. 0120 R. (1871 - Perf. 12 1/2 - Sc. #46b) - Blue. 0240 R. (1873 - Perf. 12 1/2 - Sc. #49c) - Pale Violet. 0010 R. (1880 - Perf. 12 1/2 - Sc. #37b) - Yellow Green. 0015 R. (1875 - Perf. 12 1/2 - Sc. #38b) - Lilac Brown. 0020 R. (1870 - Perf. 12 1/2 - Sc. #39e) - Bister. 0080 R. (1870 - Perf. 12 1/2 - Sc. #44e) - Orange. 0100 R. (1871 - Perf. 12 1/2 - Sc. #45e) - Pale Lilac. 0150 R. (1880 - Perf. 12 1/2 - Sc. #48b) - Yellow. 0300 R. (1876 - Perf. 12 1/2 - Sc. #50a) - Dull Violet. 0010 R. (1880 - Perf. 13 1/2 - Sc. #37c) - Yellow Green. 0015 R. (1875 - Perf. 13 1/2 - Sc. #38c) - Lilac Brown. 0020 R. (1870 - Perf. 13 1/2 - Sc. #39f) - Bister. 0080 R. (1870 - Perf. 13 1/2 - Sc. #44f) - Orange. 0100 R. (1871 - Perf. 13 1/2 - Sc. #45f) - Pale Lilac. 0150 R. (1880 - Perf. 13 1/2 - Sc. #48c) - Yellow. 0300 R. (1876 - Perf. 13 1/2 - Sc. #50c) - Dull Violet. 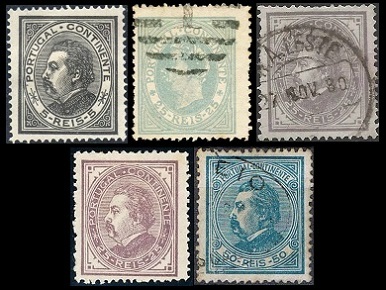 The five definitive Portugal stamps shown above were issued between 1880 and 1881. These new designs are typographed, and all of them have the profile of King Luis I. 0005 R. (1880 - Perf. 12 1/2 - Sc. #52) - Black. 0025 R. (1880 - Perf. 12 1/2 - Sc. #53) - Bluish Gray. 0025 R. (1880 - Perf. 12 1/2 - Sc. #54) - Gray. 0025 R. (1881 - Perf. 12 1/2 - Sc. #55) - Brown Violet. 0050 R. (1881 - Perf. 12 1/2 - Sc. #56) - Blue. 0005 R. (1880 - Perf. 12 1/2 - Sc. #52a) - Black. 0005 R. (1880 - Perf. 13 1/2 - Sc. #52b) - Black. 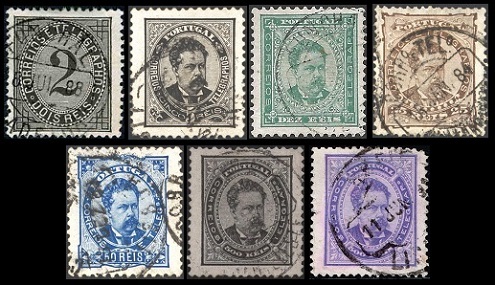 The seven definitive Portugal stamps shown above were issued between 1882 and 1887. These new designs are typographed, and all of them have the profile of King Luis I. 0002 R. (1884 - Perf. 12 1/2 - Sc. #57) - Black. 0025 R. (1880 - Perf. 12 1/2 - Sc. #60a) - Brown. 0050 R. (1880 - Perf. 12 1/2 - Sc. #61a) - Blue. 0500 R. (1884 - Perf. 12 1/2 - Sc. #62) - Black. 0500 R. (1887 - Perf. 12 1/2 - Sc. #63) - Violet. 0002 R. (1884 - Perf. 13 1/2 - Sc. #57a) - Black. 0025 R. (1880 - Perf. 13 1/2 - Sc. #60b) - Brown. 0050 R. (1880 - Perf. 13 1/2 - Sc. #61b) - Blue. 0500 R. (1884 - Perf. 13 1/2 - Sc. #62a) - Black. 0500 R. (1887 - Perf. 13 1/2 - Sc. #63a) - Violet. 0002 R. (1884 - Perf. 11 1/2 - Sc. #57b) - Black. 0025 R. (1880 - Perf. 11 1/2 - Sc. #60) - Brown. 0005 R. (1884 - Perf. 12 1/2 - Sc. #58a) - Black. 0005 R. (1883 - Perf. 12 1/2 - Sc. #58d) - Gray. 0010 R. (1884 - Perf. 12 1/2 - Sc. #59a) - Green. 0025 R. (1880 - Perf. 12 1/2 - Sc. #60c) - Brown. 0050 R. (1880 - Perf. 12 1/2 - Sc. #61c) - Blue. 0005 R. (1884 - Perf. 13 1/2 - Sc. #58b) - Black. 0005 R. (1883 - Perf. 13 1/2 - Sc. #58e) - Gray. 0010 R. (1884 - Perf. 13 1/2 - Sc. #59b) - Green. 0025 R. (1880 - Perf. 13 1/2 - Sc. #60d) - Brown. 0050 R. (1880 - Perf. 13 1/2 - Sc. #61d) - Blue. 0005 R. (1884 - Perf. 11 1/2 - Sc. #58) - Black. 0005 R. (1883 - Perf. 11 1/2 - Sc. #58f) - Gray. 0010 R. (1884 - Perf. 11 1/2 - Sc. #59) - Green. 0025 R. (1880 - Perf. 11 1/2 - Sc. #60e) - Brown. 0050 R. (1880 - Perf. 11 1/2 - Sc. #61) - Blue. The three definitive Portugal stamps shown above were issued in 1887. These new stamps are all perforated 11 1/2. 0020 R. (1884 - Perf. 11 1/2 - Sc. #64) - Rose. 0025 R. (1883 - Perf. 11 1/2 - Sc. #65) - Violet. 0025 R. (1884 - Perf. 11 1/2 - Sc. #66) - Lilac Rose. The twenty-three-year-old Luis Filipe Maria Fernando Pedro de Alcantara Antonio Miguel Rafael Gabriel Gonzaga Xavier Francisco de Assis Joao Augusto Julio Valfando (Lived: 1838-1889, Reigned: 1861-1889) ascended to the Portuguese throne, upon the death of his brother, as King Luis I.
Luis I was a cultured individual, but he had no skills in political leadership. His domestic reign was rather ineffective, as Portugal began to lag behind the other kingdoms of Europe in education, political stability, technology, and economic progress. Luis I was mostly a man of science, with a passion for oceanography. He funded research expeditions to gather specimens from the oceans of the World, and he was responsible for the establishment of one of the World's first aquariums. 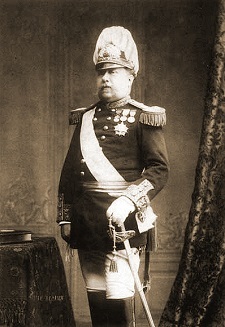 King Luis I died suddenly on October 19, 1889, at the age of fifty, and was succeeded by his son.